As part of the annual stock of muskies in Iowa’s Spirit Lake, state wildlife officials head out with gill nets to catch the biggest musky they can find spawning purposes. 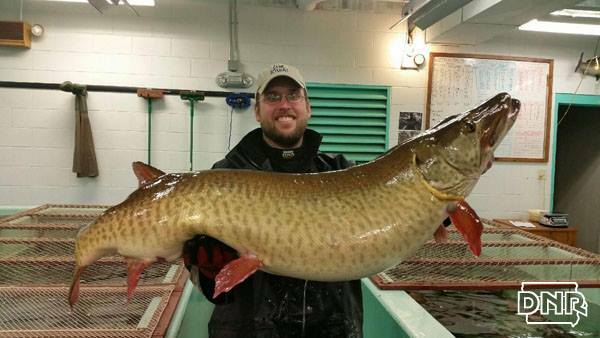 This year they pulled in a whopping 47-pounder to serve as the prized breeding male at the hatchery this year, the Iowa Department of Natural Resources reported on its Facebook page. The catch was just three pounds short of the state record, but even it did beat the record it would not have counted. Because hatchery officials tag their fish and keep detailed records they know this particular musky is 19-years-old. Stocked in 1997 as a 2-year-old, the fish has been caught seven times by gill nets and has produced eggs for the hatchery twice. In 2002, it enjoyed a tenure as a Muskie Representative at the Iowa State Fair, Iowa DNR reports.